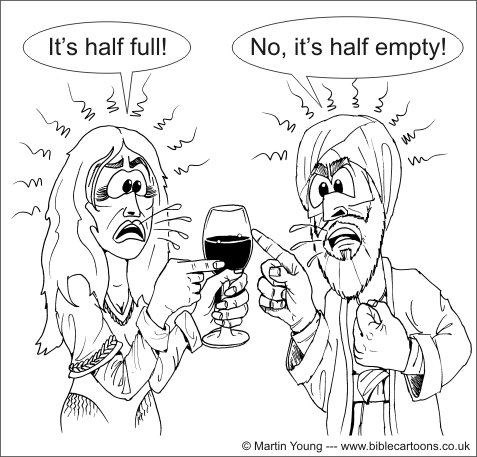 Bible Cartoons: It’s half full! Interpretation is king! Meta4 Picture: Glass half full or half empty? I was thinking about arguments & this cartoon popped into my head. 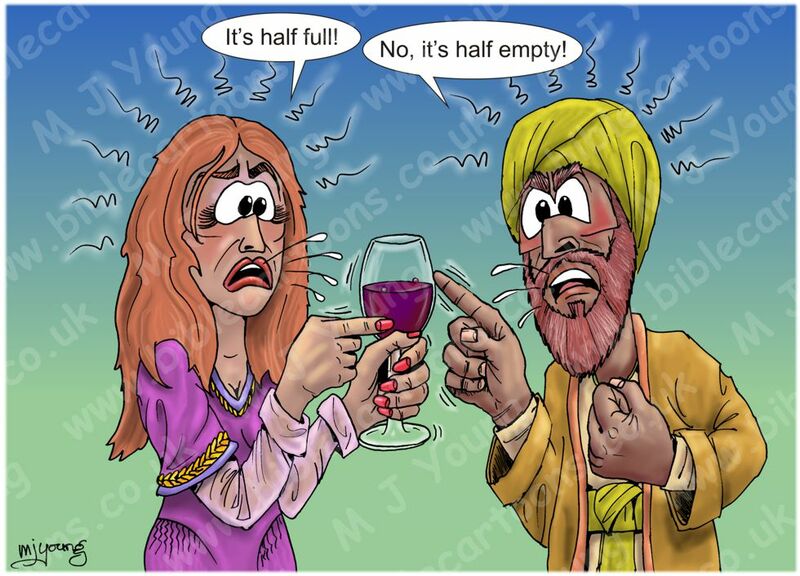 In the cartoon the glass is half full… or is it half empty? That’s what the argument is about. Of course in both instances the actual level of the liquid in the glass is exactly the same. The argument is all about INTERPRETATION of the SAME FACT. The woman on the left thinks the glass is half full, whilst the man on the right thinks it is half empty: same fact (the level of the glass) but completely opposite interpretation (or value placed) on that fact. I wonder if this observation (same fact, opposite interpretation) is the cause of some of our difficulties in the world? The immediate “real world” argument which springs to my mind is that between atheists & theists (believers in a God). I wonder if each side is looking at exactly the same facts, but interpreting those facts in completely different & opposite ways. For instance, an atheist looks at the complexity of the animal or plant kingdom & marvels at the way random chance has operated over billions of years to bring about that diversity. Whereas a theist looks at exactly the same things & marvels that God has created them in the time frame of his choice. The SAME FACTS examined (the complexity & diversity of life) but COMPLETELY DIFFERENT INTERPRETATION of those facts (macro-evolution by natural selection versus creation by supreme being). It seems that how we interpret the facts (data) at our disposal is much more important than we have realised.